Group and private chat, file sharing, and integrations for great teams! 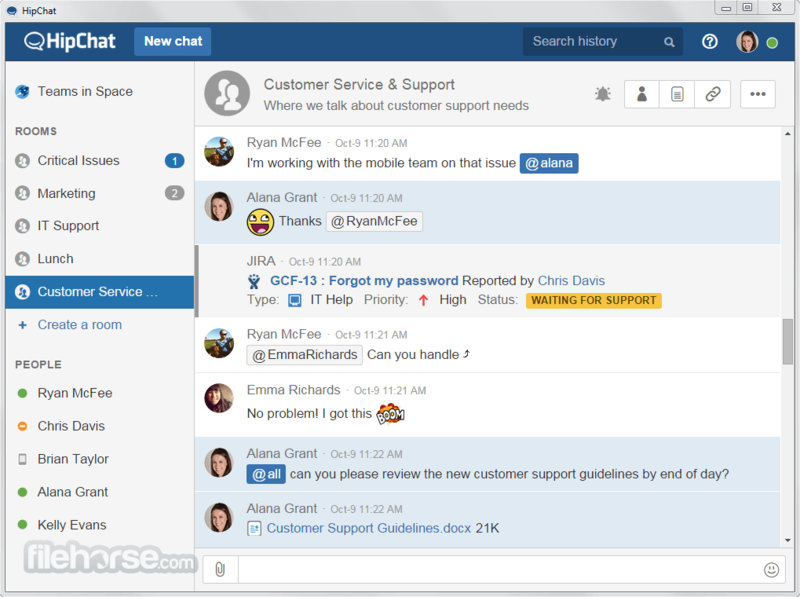 HipChat for Windows integrates with the services your team uses everyday. Get notifications and stay up-to-date with services like JIRA, Bitbucket, GitHub, Asana, Google Hangouts, Zendesk, and 150+ more. Get your groove back with custom emoticons and HipBots, animated GIFs, RSS feeds, and Twitter notifications. Work doesn't always have to feel like work. Persistent, searchable, and loaded with goodies: Amazing video calling, screen sharing, and the security your IT team craves. Stop losing momentum with reply-to-all wars and buried email messages. Cut to the chase with @mentions and get the answer you need. Your team will never miss an important message with apps available on Mac, Windows, iOS, Android, and Linux. Fear not, people who hate installing things: There's also a web app. Download HipChat Offline Installer Setup for PC! Security is #1. HipChat's secure conversations are transferred in 256-bit SSL encryption – the same security protocol as online banks. Bring clients, vendors, and other third-parties into a HipChat room. They'll only see what you want them to see. You have complete control. For when you need to show, not tell. Share your desktop with your colleagues on any device to collaborate in real time. Grab and share files from your desktop, Dropbox, email, or anywhere. HipChat shows a preview of the file to everyone in the room. Create rooms for projects, teams, clients, or the lunchtime basketball league. When you're finished with a chat room just archive it. Customize how HipChat alerts you when you miss a message. Create a combination of in-app, email, SMS, and mobile push notifications. Every room is searchable by keyword, including text, links, files, and more. If it's discussed in HipChat, it's saved forever. We got you. HipChat synchronizes across desktop, mobile, and web apps. That means conversations are never lost when you switch devices. Download HipChat Offline Installer Setup for PC! Note: This application has been discontinued.